Tec 7 specialise in supplying high quality construction products for professionals. Our aim is to simplify the work of all trades-men and assist them in carrying out their job with excellence. Our product leader, TEC 7, has become a house-hold name over the past five years. TEC 7, not to be confused with a silicone sealant, is a hybrid polymer with high tensile strength and unique bonding abilities. 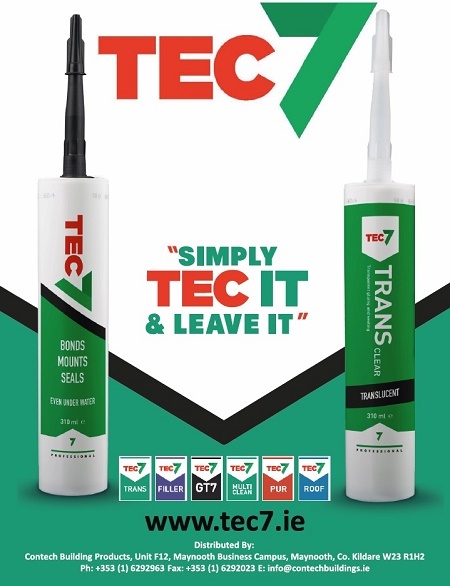 Tec 7 is the sealant chosen by professional builders and DIY users alike. It is a hybrid polymer product for flexible bonding and sealing. Tec 7 can seal, mount and bond all common building materials - even under water, eliminating the wait or need for damp or wet surfaces to dry and meaning you don't have to carry the usual assortment of adhesives and sealers to each job. Tec 7 will remain flexible without compromising its strength so it can be used anywhere that a normal silicone would be used without the possibility of shrinking or rotting. When you work with Tec 7 you can be certain that your work will be guaranteed to last for a minimum 10 years. Tec 7 is both UV and Mould resistant so will not discolour when exposed to sunlight and will not shrink.